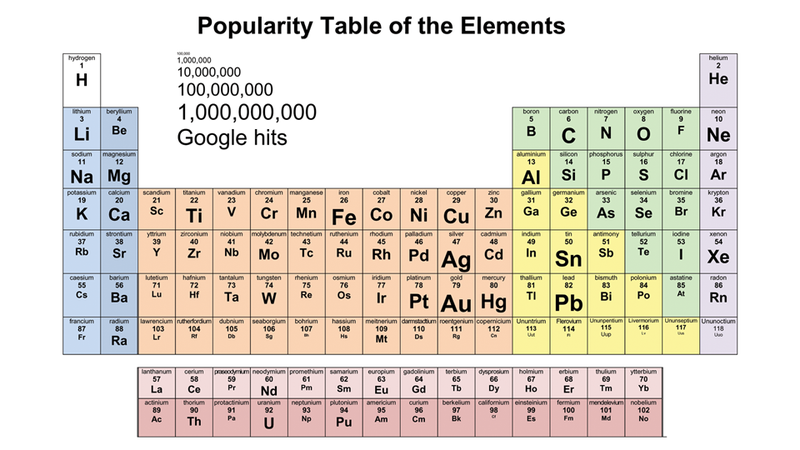 What's the Most Popular Element? Sure, we can't breathe without H or make squeaky chipmunk voices without He, and Ne is the king of strip-club signage. But being important—or even just in ample supply—has nothing on being popular. And this brilliantly reimagined periodic table shows us just how much we really care about the elements. The results in Anders Sandberg's Google-search-based visualization hold their fair share of surprises; gold and silver win the day—what's more popular than money?—while Bohrium and Livermorium barely register, a harsh blow for transuraniums everywhere.